One of the more intriguing aspects of the local food movement in the United States is the effort to increase demand for fresh, locally produced food in low-income neighborhoods. Many of these communities are referred to as “food deserts“ because trying to find fresh fruit or vegetables to buy there is like trying to find water in the Sahara. These neighborhoods don't lack food stores, but most of the stores are corner shops, not large groceries, and mostly they sell high-calorie packaged foods laced with sugar. But in a number of cities around the country, there is an effort to encourage corner store owners to stock fresh, healthy food. At a recent urban agriculture conference in Lynchburg, Va., the director of an urban farm organization from Richmond commented that many of the visitors to their farmers' market were “hipsters.” In order to reach more of the people who live in the neighborhoods they want to serve, the group has to reach out to the corner stores. That's where many residents do their shopping, not at the farmers' market. One of the tools they use is to offer stores help with purchasing refrigerators to keep the fresh food. It takes that kind of financial assistance to get store owners to accept the risk of trying something new. Once upon a time these small stores sold fresh food, but that changed with the departure of higher-income households to the suburbs. Now, people of means are returning to cities, notably in Washington, D.C., which has seen remarkable demographic change in the past 20 years. While many neighborhoods continue to be food deserts, the presence of more monied citizens nearby has motivated some corner stores owners to accept some fresh produce. “The owners of these stores know change is happening, which is why they're willing to take part,” says Janell Walker, Director of Nutrition and Community Outreach for D.C. Central Kitchen. 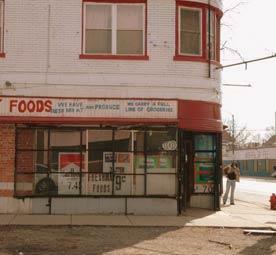 I was surprised to learn this outreach to corner stores is happening across the U.S. Certainly it is a good thing if the local food movement can broaden its reach to tap underserved markets, as well as those who have shopping options.